For commercial foodservice business operators needing their food equipment serviced and maintained, General Parts Group of Louisville is here to help. Located at 2736 River Green Circle, Louisville, our industry-certified and factory trained technician staff possess the knowledge and experience to service your major equipment, such as commercial oven repair, as well as the HVAC system, refrigeration and ware-washing systems. Our service team at GP-ServiceDirect respects the unique nature of every commercial kitchen and the importance of providing a customized approach with effective service. This is why we include a 90-day labor warranty on our work as a sign of our commitment. For further information, you can contact our Louisville office at (502) 400-7650 or email KYDispatch@GP-ServiceDirect.com. Emergency services –No matter the time of day, we understand the need for immediate commercial appliance repair and the benefits that it can have for your business. General Parts Group offers emergency repair 24 hours per day. 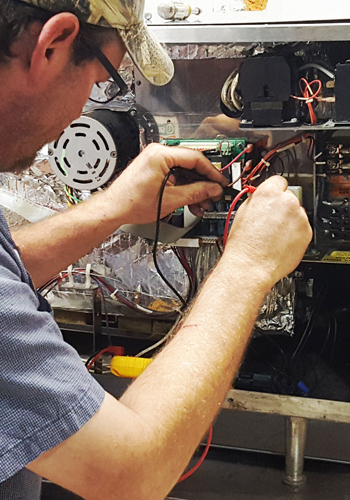 Personalized repair procedures – We understand every kitchen is unique, that is why our staff tailors planned maintenance programs to ensure that our restaurant equipment repair services take these differences into consideration. No matter what kind of food you are serving or the nature of your kitchen’s design, our services will ensure that all your needs are accommodated. Qualified technicians – Our entire team of commercial appliance repair technicians is factory trained and industry-certified, possessing all of the knowledge and know-how needed to keep your kitchen functional. Hiring our food equipment service experts at GP-ServiceDirect will guarantee you quality and effective services that are unmatched by local competitors. Repair – All of your needs in just one service call! Our factory-trained, industry-certified technicians would repair anything that stops working, bringing it to specification in your restaurant or facility. Smaller movable appliances may also be dropped off at our offices for shop repair. Constant communication – At General Parts Group, we understand the need to be involved in everything that’s going on in your kitchen. To satisfy this need, our Automatic Status Update System ensures that you are kept in the loop when in comes to the repairs and procedures that we are conducting. Online Information – All information pertaining to the repairs and food equipment service we have done for your operation can be found on our Customer Portal. Access can be found at the bottom of our website. Click here to request access. Quality parts – General Parts Group of Louisville has a large selection of O.E.M. parts of which our technicians work from. For those that prefer to replace a part on their own, our inventory is available from our Parts Division, GP-PartsDirect. Visit our online store to find what you need GP-PartsDirect.com. We’ll waive the ground delivery fee when the part is picked up from our Louisville location. 90-day Labor Warranty – Your success is our priority, which is why we offer a 90-day labor warranty on our services.